Edita - 30 Mexican bathroom ti.. The ninety pieces set of the tiles (the contents of one box) measuring 10 cm x 10 cm will allow for covering a square metre of the surface. The tiles are abrasion-resistant and even with deeper scratches the pattern is still visible because the colours are incorporated in the glaze. Each tile is first covered with an undercoat – brown colour, and then each colour is laid separately according to the design. After burning, the tiles obtain their final colours as well as high resistance. We recommend three interesting films presenting the whole process of producing the tiles and laying colours and designs: Production of hand painted tiles. If you've got any questions please contact us. We'll be happy to help you. We deliver our products to the following European countries : UK, Germany, Austria, Belgium, Bulgaria, Cyprus, Czech Republic, Denmark, Estonia, Finland, France, Germany, Greece, Hungary, Ireland, Italy, Latvia, Lithuania, Luxembourg, Malta, Netherlands, Poland, Portugal, Romania, Slovakia, Slovenia, Spain, Sweden, United Kingdom, Norway, Ukraine. 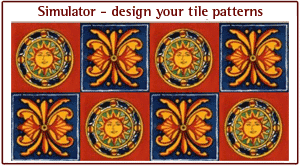 Tags: mexican tiles, mexican decorative tiles, colour tiles, mexican Talavera tiles.